in entertainment which has been filled with twists, turns and many surprises along the way. She is a mistress of storytelling, and fearless host and an accomplished chanteuse. During this much anticipated show, Dawn will tell her tale of two dress sizes and share some of the secrets behind some of her most treasured collection. There will be plenty of songs from the 50s & 60s, a sprinkling of nostalgic dance and ample belly laughs. 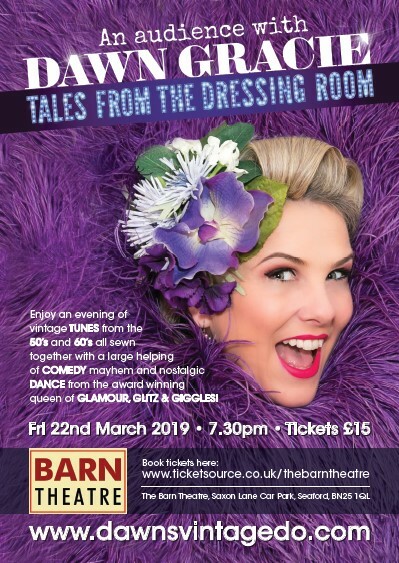 This is a true vintage tale suitable for grownups with a good sense of humour, an appreciation for sass and who don't mind a good old fashioned toe tapping evening.